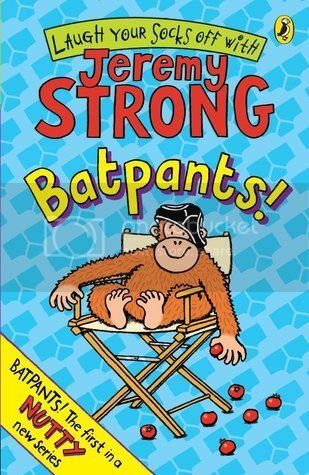 Batpants is an orang-utan who is most definitely part of the family, she love to spit tomatoes, swinging through the trees and her pants. She lives with the Loveharts, Mrs Lovehart is a stunt woman and this book follows her and her family on her latest action film and the chaos that happens around them. Jeremy Strong, I am starting to think that he can do no wrong (apologies for the rhyming!) But whichever book of his I picked up to read to my class they always seem to entertained and this was no exception. His characters are always entertaining, funny and easy to relate too. In this case we have a normal family... well I say normal but what family is actually normal?! This is a family which most children can relate too because most of them see there brother. sister, Mum or Dad in one of these characters. The only difference being that instead of having a pet dog or cat... they have an orang-utan instead which only leads to more amusing antics. We go on their adventure to the film set of their Mum's latest film, we meet movie starts with humorous names, love interests who aren't as they seem and some evil characters along the way too. It however is not simply the characters or story line or witty lines that make this story amusing but also the illustrations to match. My class may already be in hysterics as I read this story but as soon as I turn the book around to show a pictures the laughter increases. Another brilliant children's story from this talented author. I always give my children the choice of between a Jeremy Strong book or someone different, but there is no real choice. Strong wins every time! Group Collaboration | Favourite Reads of 2013!